The precisely engineered components of the Buku Power Exhaust System use the unique exhaust pressure characteristics of nitro motors to dynamically adjust the tuned length of the exhaust system. This is why Buku Power Exhaust System can achieve maximum performance over a much wider RPM range than is possible with a fixed pipe. Changing of the tuned length is accomplished by the movement of the internal Tuned Assembly within the Buku Power Exhaust Body. The Buku Power Exhaust is really two separate pipes within one. The internal pipe, or the Tuned Assembly, is the active component in creating the pressure waves necessary for maximum power. 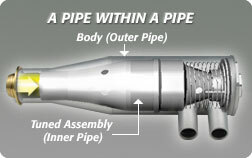 The Tuned Assembly dynamically adjusts during acceleration by sliding inside the outer pipe or Body. Adjusting the internal spring tension quickly and easily from the externally located Spring Adjustment can precisely control the movement of the Tuned Assembly. While at idle, the spring tension holds the Tuned Assembly at the shortest tuned length. By remaining at the shortest tuned length, the total volume of the pipe is effectively reduced allowing full exhaust pressure and maximum fuel flow to be achieved very quickly. This results in improved throttle response. When the throttle is opened, the Tuned Assembly will move almost instantly to the full tuned length, dramatically improving low-end torque and mid-range power. The power increase is likely to be more than 10% over a well designed mid-range pipe and more than 20% over a high-speed pipe. The Tuned Assembly will remain at this full length until the motor reaches the point where the extended tuned length is no longer beneficial. It is this point where a fixed low-RPM torque pipe will fall flat and fail to deliver any further performance. The Buku Power Exhaust System, however, will automatically respond to this condition by reducing the tuned length to a point that optimizes performance. Ultimately, the Tuned Assembly will return fully to the shortest tuned length throughout the acceleration and remain there until the engine RPM is reduced. This automatic adjustment of the tuned length will happen continuously during operation and even through gearshifts, always adjusting to produce maximum power.